When preparing for the biggest speaking gig of her career, Meg Fenn, Director and co-owner of Shake It Up Creative, developed a speaker preparation playbook and is sharing her top 5 tips for Brighton SEO speakers. This can also be very useful for anyone getting ready for a speaking engagement in any industry sector. Brighton SEO, a twice yearly event and described as Europe’s biggest search marketing conference attracts some of the internet’s most exciting talent. 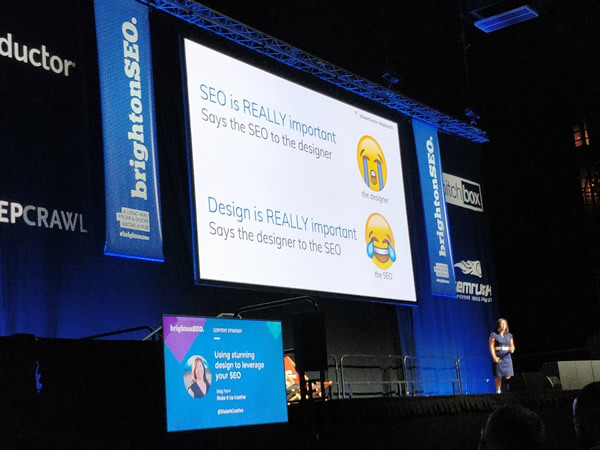 Meg’s talk on using stunning design to leverage SEO was voted by attendees to be on the main stage, so she spent a great deal of time preparing to speak to an audience of up to 4,000 people at the Brighton Centre. 1. Give yourself plenty of time to prepare, start early. 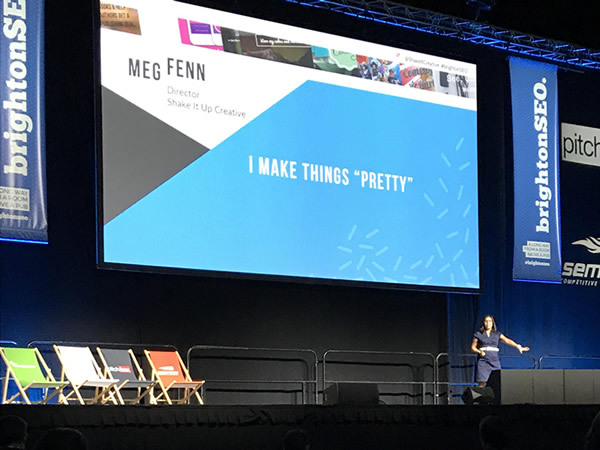 As Meg had attended Brighton SEO several times before, she knew the standard of talks was very high and some of the best keynote speakers in the digital industry take the main stage. She started planning the content of her talk very early on, back in May, just after the last Brighton SEO conference. Whenever a thought popped into her head about what she wanted to say, she would make a note of it on an ever growing document which she later used to form the basis of her talk. Once she had the outline in place, she started to design her slides. This part was very time consuming because, according to the Brighton SEO speaker slide guidelines, no bullet points are allowed – they like to have a slide for each point. This means Meg’s initial slide deck was over 100 slides (she cut it down to 83 for the final presentation). Take time over your slides. Ensure that they look great, are legible and also reflect your company’s brand and style. Meg used Shake It Up Creative brand colours throughout and created the graphics to tie in with the style used on the company website and roller banners. She also used the rule of thirds to help create visually impactful slides that help to illustrate or bring to life what she was saying in the talk. Now, because she knew she wouldn’t be able to use notes during her talk, Meg built some hints or clues within her slides to help her remember what she wanted to say. Some of these were visual clues and some were more similar to mnemonic clues. This was really tricky because she didn’t want it to be obvious to her audience that she was simply reading the slides (some were more successful than others!). The BrightonSEO organisers offer a lot of support to their speakers and even put on a training day with professional speaking coach Matt Matheson. Meg jumped at this great opportunity and went up to London for this full day of speaker training. Attendees included Measurefest speakers as well as Brighton SEO speakers and by the end of the day, Meg felt she had made new friends who were all very encouraging and another source of support. The training itself was truly excellent and Matt is a fantastic speaking coach. Going into the session, Meg had only recently found out she was going to be on the main stage and was saying to herself “I can’t do it, I just can’t”. By the end of the training day, she was saying “Yup, I can do this and I’m gonna rock it!”. A huge transformation brought on by the exercises Matt had facilitated and the tools he gave all of the attendees to be able to speak with confidence. For other conferences that do not offer this, seek it out yourself – there are lots of speaking coaches and courses that can help you (we recommend Matt Matheson!). This advice is directly from Matt Matheson, professional speaking coach and one of the many takeaways from the session described in tip number 3. Matt says that if you know your first minute inside and out and can say it in your sleep, then that will set you up in terms of confidence and the rest of your talk will flow. Meg practised the first minute both with and without slides, out loud, every day after the training day, sometimes several times a day. She knew she might need to ad-lib a tiny bit to comment on the two speaker’s talks that went before her but also knew that if she didn’t feel confident about doing that, to simply focus on her own first minute. Turns out, this is a crucial bit of advice and one that you MUST follow as it truly helped Meg on the day and once she got through that first minute, she felt a little more relaxed and super confident. It’s still scary up there in front of a full crowd on an enormous stage (about 4,000 people) but due to all of the practising of her first minute, the nerves were under control. This was a challenge for Meg as she constantly has a full work schedule and a busy family life. But for about 5 weeks, she spent a great deal of time and effort setting up practice runs and delivering her talk to everyone from her cat or her teenage children to willing neighbours or work colleagues. This really helped to put her out of her comfort zone time and time again and get used to speaking in different settings to different people. She is very thankful to everyone who made time for this and wants everyone to know how helpful it was. Thank you! Although it is impossible to replicate standing on a large stage in a great big room with thousands of people, practising in this way helped her to not only remember her talk but to be able to hone it and deliver it in a natural and engaging manner. She didn’t actually know how she would feel on the day once she climbed those stairs and was standing on that stage. One great thing about practising to different people is you get lots of great feedback which is not only encouraging but incredibly useful. One of her practice runs was with a public speaking Toastmaster expert, Vivienne Smith, who gave a really good tip; use your fingers to tap each point out on your leg/thigh which helps to remember what it is you want to say for each slide. Meg used that technique for the slides that were proving tricky to remember. Again, it is the practising that meant Meg’s talk was successful – do not underestimate this. Allow for plenty of practice time, especially if you’re trying to fit it in around a busy work schedule, remember to start your speaking preparation early. 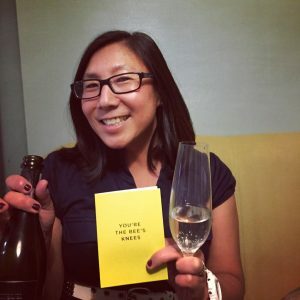 One thing that Meg was apprehensive about from the start was the fact that she is a non-SEO speaking at an SEO conference. However, because her talk topic was voted to be on the main stage, it seemed that people working in search were interested in what she had to say. Live stream of the main stage talks by Authoritas. Here are Meg’s slides on Slideshare. Here is a small selection of tweets during and after Meg’s talk. It was hard to keep up with them all, but Rachael (Director) and Lillian (social media manager for Shake It Up Creative) did a fantastic job with it all. Here’s another important point – Rachael provided tremendous support and encouragement to Meg leading up to and on the day. She even gave Meg a celebratory gift afterwards! Find out more about Brighton SEO. And we hope that this speaker preparation playbook helps you if you have a speaking engagement booked in. After 3 years in business together running Shake It Up Creative, Meg and Rachael are still true to why they started up in the first place. Read Shake It Up Creative’s start up story. Media friendly!! That makes it easy for the audience to snap and post! Excellent job! So happy for you! Thank you for sharing this priceless advice and you authentic experience!!! Happy third birthday Shake it Up Creative!!! Thanks so much Heidi! Love your comments, they are so inspirational for us. Thanks for your support and all your birthday wishes. Well done Meg – you deserve to do as well as you do (in life and) business because you always approach every challenge with integrity, enthusiasm and an inspiring level of commitment. Thanks for the mention and glad you rocked your presentation, not that there was ever any doubt about that! Thanks Vivienne! Your tip was very helpful, thank you. Feels great to have rocked it!